A “living sculpture” that pays tribute to the forgotten African heroes of the Great War. Juliet Hindell reviews. Avenue Armory. Photo by Stephanie Berger. KABOOM: William Kentridge’s musical, magical extravaganza remembers the millions of Africans that served in World War I, and it explodes with artistic force into the great hall of the Park Avenue Armory. Melding drama, music, shadow play, and huge projections, this show expands, in both form and content, the horizons of what a performance can encompass. Expands, or even explodes: the word KABOOM is repeated dozens of times in one of the early scenes. The play covers so much ground it’s hard to describe it without making it sound like a crazy mishmash—it’s as much a living sculpture as a traditional play. 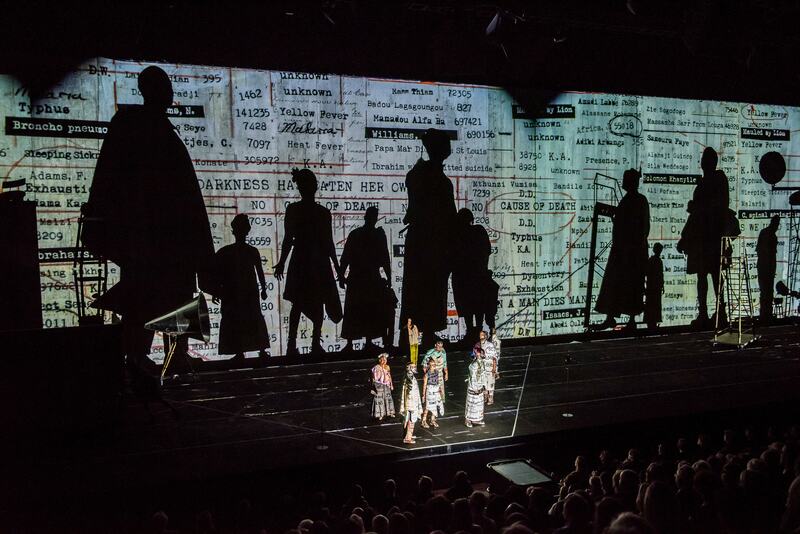 Kentridge is renowned for productions that mix mediums and genres. Here, the South African artist focuses on the forgotten heroism and the exploitation of Africans at the hands of their colonial masters from Britain, France, and Germany during the great war of 1914-18. The Armory commissioned the work to mark the centenary of the war and it’s moving to see the piece in a military drill hall where relics of the same war—memorials to Americans who died that say “Patria et Gloria”—are also on display. The magnitude of the historical omission is mirrored on the vast stage, spanning 60 yards, on whose huge backdrop are projected immense collages of documents from the period. Pages from ledgers tally the numbers of Africans assigned to carry huge cargoes across the African continent. They hauled everything their European masters deemed necessary to “civilize” Africa, including cricket bats, hymn books and even a steamboat. Although the colonists kept meticulous records of every object that was transported, “Our deeds were not recorded” says one of the porters. A shadow play brings the Sisyphean task into sharp focus as cast members carry silhouettes of baggage, recreating their endless treks. The title The Head and the Load is inspired by a Ghanaian proverb, “the head and the load are troubles for the neck”—and it’s clear that the porters are the ones suffering those troubles. The libretto largely consists of contemporaneous texts, including the Dada art movement’s manifesto and excerpts from the French Caribbean writers Frantz Fanon and Aimé Césaire, translated into African languages. The actors switch among languages and nonsense lines with ease, and only partial translations are offered in subtitles on the backdrop. But the lack of translation doesn’t matter: the raw emotion of the colonized fighting for a cause that is not their own and that they don’t understand needs no interpretation. An extended scene depicts a man trying to support his compatriot and keep him standing as the life drains out of him. In another scene, we see Africans repeatedly swatting away insects as they make their buzzing sounds and images of the offending creatures are projected behind. The musical performers are all outstanding, with N’faly Kouyate (accompanying himself on the African string instrument the kora) and Ann Masina, the superb opera singer, being particularly memorable. A rendition of the British national anthem “God Save the King” brings a whole new meaning to the lyrics. Many of the cast are regular collaborators in Kentridge’s plays, including Joanna Dudley, who here represents Germany’s invading forces dressed in an eagle topped helmet and a stiff white pleated skirt. (The costumes are by Greta Goiris and are clearly designed for their shadow-creating potential.) Dudley spends much of the show on top of a tall ladder barking orders at others. As each new event within the performance unfolded, it felt like turning a new page in an old scrapbook, full of ephemera and odd snapshots of a lost world. If Kentridge’s intention is to expose the colonialists’ shameful conduct, he succeeds with this beautiful and poignant piece.